On Friday, St. Clair Software announced the initial release of App Tamer, a Mac application geared towards giving you a faster computer and a longer-lasting battery through the magic of not-making-your-Mac-work-as-hard. Behind the scenes, deep in the heart of OS X, all Macs have the capability of temporarily halting any running application. This drops its CPU usage to zero, which corresponds to the above increases in system performance and battery life. However, you need some geek skills (or geeky utilities) in order to halt applications, and you have to manually wake them up before they can be useful again. App Tamer aims to provide the best of both worlds. App Tamer will automatically stop any application you choose when it is in the background, and automatically bring it back to its full vitality when you bring it back to the foreground. You can choose which applications are stopped, how long the pause should be before this occurs, and whether this should happen all the time, or only when you’re running off battery power. App Tamer can also helpfully gray out the windows of paused applications to remind you that they’ve been halted. 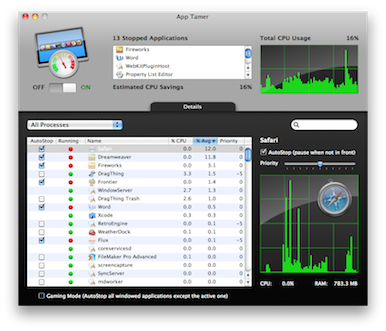 AppTamer requires Mac OS X 10.5 Leopard or higher, and costs $15 for the first license, or $12 each for multiple computers. A 15-day free trial is available.